Sometimes, when you are at the PC, time seems to fly: maybe you're working hard at some of your projects or just surfing the web and... time passed so quickly you didn't even realize it! The tiny little clock that comes with Windows doesn't really do justice to your eyes, you deserve better! 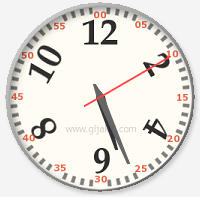 You deserve a beautiful and smart analog clock! Beautiful, because it comes with a vast array of skins that will surely meet your taste. Smart, because it remembers your appointments, whether it is your daily lunch break, or an occasional visit to the dentist! Beautful! You'll love the 25 50 themes provided! Smart! It remembers your appointments! Easy! You don't need a degree in computer science to use it! On Top! If you like, it will always be displayed, no matter how many windows you have open! Customizable! Change the background picture to anything you like! Unintrusive! Make it the size you like: choose between four pre-defined sizes or size it like you want! Serious! Clock will not mess with your system registry! Small! It's only a 1Mb download! *If you're enthusiast about this program, please consider making a donation!